There is an updated post New in the CSS horizon: flexbox to be published shortly with updated code and better explanations. I refer you to that article for an update on how Flexbox works and better (and fully tested) working examples. 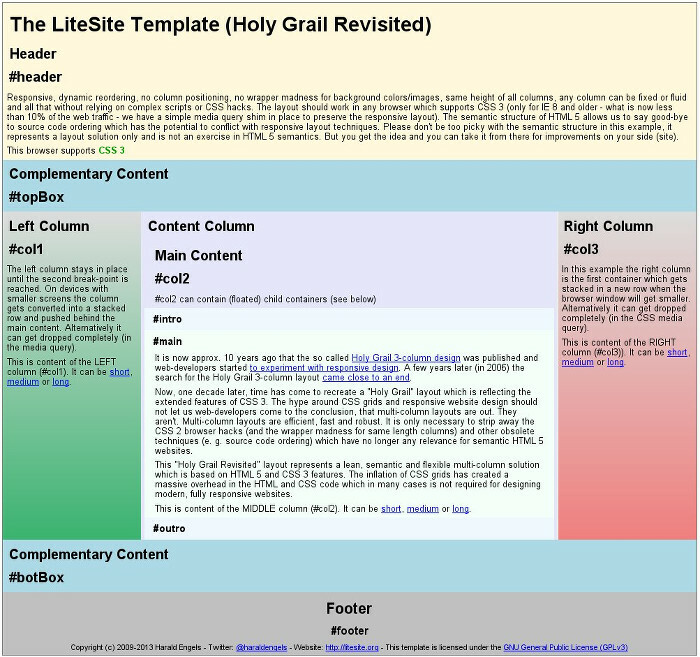 One of the hardest things to do in web design is to create a fluid 3 column layout, also known as the holy grail. I could talk for hours about how it was goo enough for the technologies available when the model was first developed, how much of a pain it is to implement correctly, how it did not support mobile and small form devices and how long have developers wanted a solution. Instead I will talk about a solution that has finally become widely available. With the release of Firefox 28 to wide availability, the last of the big 4 browsers now supportd the full flexible box layouts specificactions. This means we can do some awesome crazy things with layouts that, until now we could only dream about. In this article I will explain what Flexboxes are, the terminology, syntax, new CSS required to make it work and end with reworking the Holy Grail Layout using Flexboxes. Flexboxes don’t use the same terminology as other CSS elements. We need to discuss this terminology before we can fully understand and use the new layout in our own work. The outermost container for our Flex Layout. We create this by assigning flex or inline-flex as the values of the display property depending on whether you want to use the Flex Container as a block or inline element. Every element inside our Flex Container becomes a Flex Item. When we put text on the page as a direct child of the Flex Box it’ll be wrapped on an implicit flex item. There is no need to declare these elements explicitly. Indicates the order (positive numbers without a unit) in which the items in a row are displayed. The default is to display them in source order. Indicates the proportion that an item can grow by if necessary. If all items have flex-grow set to 1, every child will set to an equal size inside the container. If you were to give one of the children a value of 2, that child would take up twice as much space as the others. Indicates the proportion that an item can shrink by if necessary. If all items have flex-shrink set to 1, every child will set to an equal size inside the container. If you were to give one of the children a value of 2, that child would take up twice as much space as the others. This is the shorthand for flex-grow, flex-shrink and flex-basis. The flex-shrink and flex-basis parameters are optional. Default is 0 1 auto. If this property is set, it will override the align-item property of the parent. The pen is copied below. Edit the pen in Codepen to see the full layout. Internet Explorer 10 supports an old incompatible draft version of the specification; Internet Explorer 11 has been updated to support the final version.